Once upon a time... a long time ago I had a fairly simple system for dealing with my photos. I took them (12, then 24 to a roll) they got developed, I wrote notes (if I was organised) on the back and they got stuck in an album. Simple. There were never that many photos as film was expensive and so was developing... remember Tripleprint where you got one regular size photo and two wallet sized photos to share with friends?! Then a revolution happened. Digital photography. It was slow to start at first. My first digital camera was a webcam (probably one or two megapixels). The next few cameras weren't much better although the next was an actual camera and the one after that had the now familar LCD display and a flash. You can't print most photos from that age as the size is about 320x240 and the resolution too small. I changed my digital cameras about as often as my mobile phone got upgraded, sometimes more often. It was sometimes for an upgrade in performance and on occasion because unfortunate accidents befell them (once technical, twice physical) and once because I just didn't like the camera. The upshot is in the early days when the cameras weren't 'all that' I took about as many photos as with an old style camera. As the cameras improved (and I think significantly the cameras on my cell phone improved and automatically synched to my PC) the amount of photos has exploded. This is a screenshot grabbed this morning. 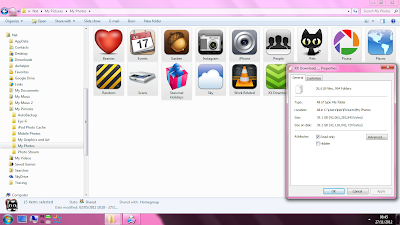 That is right, over 20,000 photos in nearly 1,000 folders. Little wonder I can never find anything. The top level structure looks deceptively organised, but it hides (it would appear) total mayhem. Most of the pictures have no titles, few are tagged - finding anything in a hurry requires the luck of knowing where you last saw it. So today (as it can be done almost lying down in bed) my task is to try and organise the photo folder into something that might resemble the albums of old. And seriously... the oldest photos don't have Exif Data, but there seems to be about 8 years worth of folders... over 20,000 - I think some of the rubbish ones need throwing away! 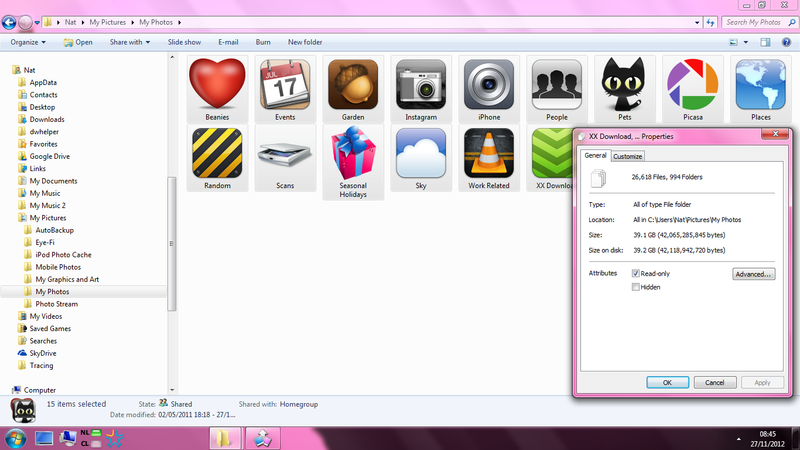 Distressingly there are also photos in other places than the 'My Photos' folder, which need to be gathered and sorted. It is only slightly better organised on Flickr who took the file structure largely from the upload folders, but hey - problem for another day!